Want some advice from a pro to help you get the behavior you want from your child? #AskDrG is coming to SheSpeaks! Parenting expert Deborah Gilboa, M.D. aka “Doctor G” is a family physician, mom of 4, international speaker, author and TV personality. She developed the “3 R’s of Parenting” to empower parents to raise respectful, responsible, and resilient kids. Her new book, Get the Behavior You Want, Without Being the Parent You Hate releases September 10th (available at Amazon). From teaching the skill of respect to building respect at the dinner table to teaching your kids independence and how to pay it forward, Dr. G has the low down on useful parenting strategies that will simplify the process. On the day of the chat, we will post a photo of Dr. G to our Facebook page at 1PM ET— and the chat will start. Ask your questions right in the comments section on Facebook under her photo and Dr. G will be answering them - live and on the spot! You can also ask a question in advance by posting it in the comments below & we will present it to Dr. G on the day of the chat! 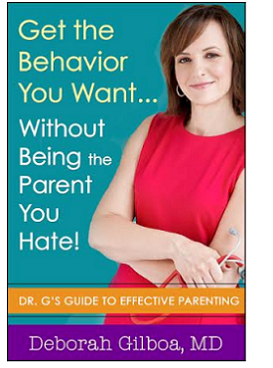 We are also giving away 5 (FIVE) signed copies of Dr. G’s new book Get The Behavior You Want... Without Being the Parent You Hate! To be eligible to win, participate by commenting during the Facebook chat. Winners will be randomly selected. No purchase necessary. win her new book bit.ly/1oVshoC"
*Open on Friday Sept 5, 2014 from 1pm-2pm ET to USA residents over 18 years of age. United States only. This giveaway is not sponsored by, or associated with, Facebook. No purchase necessary. How do I get my 19 month old to stop climbing EVERYTHING???? I have been told to just let him climb and he will quit when he falls, but he has fell and then after crying for few seconds...he gets right up and does it again!?!? UGGHHHHH!!!!!! Advice for de-escalation of sibling arguments (especially when your own anger levels are increasing every second it progresses). How can I make time outs more effective? They work miracles for my 8 year old son, but we can't get his 5 year old sister to accept the time out at all! I need help w/ my 5 yr. old son. He goes to 5K at a small Christian school where he also attended 3K & 4K. He started having problems w/ bad behavior last year. This year he is getting in trouble a lot already at school. He doesn't pay the best attention and he doesn't really think about things before he does them, yet he is very smart and the best reader in his class. He talks, cuts up and doesn't always pay attention in class though, which disrupts others learning. He also gets angry very easily, but not for a long time, normally just a burst of anger. Can you give me some advice?